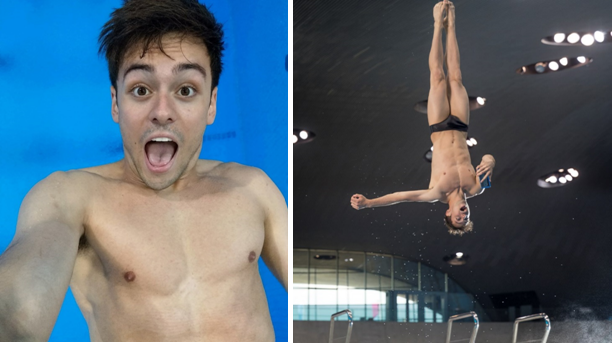 Tom Daley dived head first into the latest self-shooting phenomenon as he captured some mid-air shots with HTC’s brand new smartphone, the HTC U11. Vying for the title of the 'most extreme selfie', the Olympic Diver got on ‘swimmingly’ with the new squeezy picture function at the London Aquatics Centre, taking what is believed to be the first ever selfie during a reverse rotation ‘gainer’ dive. It took just a few hours for Tom to master the perfect diving selfie after practicing from a variety of heights, including the ten-metre diving board and one metre springboard. 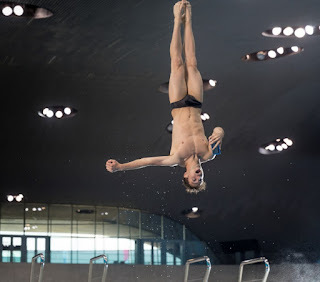 The slower rotation of the ‘gainer’ dive - the acrobatic trick of performing a backwards somersault while still moving forward - from this height allowed Tom to make the most of the HTC U11’s squeeze functionality and produced the most Instagrammable pool backdrops. This is the first time that any photography of this kind has been taken at the famous Olympic swimming venue. 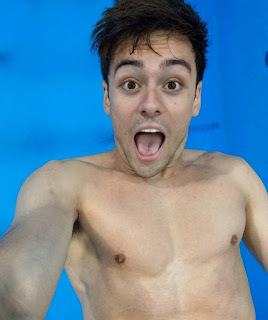 The series of extreme diving selfies and slow-motion videos taken by Tom were made possible by the world’s first squeezable selfie function on the HTC U11. A simple squeeze of the phone launches its camera app, allowing users to take selfies from places and angles that were never before possible, without unnecessary fumbling to reach the selfie button, or dropping the phone whilst posing. Tom Daley said “I love taking a selfie, so when the challenge arose to try and take one, and capture myself mid dive, I obviously jumped at the chance. The HTC U11’s amazing ‘squeeze to selfie’ function made this possible, and might even be a world first! It took a few attempts to perfect my dive, but after a few belly flops I got there. I have to say the final photos are easily some of my favourite diving shots ever”. As well as its world’s first ‘Edge Sense’ squeezy selfie feature, the HTC U11 has a waterproof rating of IP67, making it the ideal device for those looking to ‘splash and flash’. The HTC U11 has also achieved the highest ever DxOMark rating for both its photo and video capabilities, making it the leading smartphone camera on the market. Super-fast autofocus in all lighting conditions make the camera quick, producing sharp imagery and smooth video. The HTC U11 also introduces Auto HDR Boost, offering clearer, more balanced pictures with enhanced textures and colours – perfect for the Instagram fanatic. HTC flagship smartphone HTC U11 is priced at INR 51,990 /- in India. The HTC U11 is now available on both online (Amazon.in) and offline channels in India in Amazing Silver and Brilliant Black colours. *The HTC U11 has an IP67 rating and is dust, splash and water resistant up to 1 metre of freshwater for up to 30 minutes and tested under controlled laboratory conditions. Normal wear and tear may decrease splash and water resistance over time. Do not attempt to charge or otherwise use the USB Type-C port on a wet HTC U11. For drying instruction and tips on maintaining water resistance, consult the user guide, support site, or the Help app on the device. Liquid damage may not be covered under warranty.